Extract from Ink on my Fingers: A Life in Journalism, the unpublished memoirs of J. G. W. Rourke (1869-1940). I met Edward Moon only once. We had certain acquaintances in common at the Metropolitan Police Force, gentlemen whose company I had carefully cultivated and who, from time to time, had found themselves turning grudgingly to Mr Moon for assistance. It was through them that I was able to communicate my request for an interview. I think the notion touched his vanity. Certainly, he was a man who relished any opportunity to speak at length upon his favourite subject, namely: the life and works of Edward Moon. This would have been towards the end of 1898, around the time that his reputation had begun to fade and his name, already mired in scandal and disgrace, became a byword for a certain kind of dishonourable failure. Not that Moon’s behaviour revealed any obvious cognisance of these facts. His manner was loftily assured and he propounded his opinions with a confidence which bordered upon arrogance, apparently wholly unaware of the degradations which were being heaped upon his character in every drawing room in London, happily oblivious to the plummeting nature of his fortunes. At that time, he still lived in a set of specially constructed rooms beneath his theatre. It was there, in the so-called “Theatre of Marvels”, that, every night except Sunday, he performed his act - a curious hybrid of conjuring, illusion and grandstanding displays of deductive reasoning. I was met at the door by a small, grey-haired woman who appeared to be my subject’s housekeeper and who gave her name as Grossmith. She led me through a warren of interconnecting rooms to a cramped and darkened library in which every conceivable inch of space had been filled up by books. Here, Mr Edward Moon sat waiting - tall, a little stooped, his dark hair just beginning to grey - with his associate sitting beside him, an freakishly large man of indeterminate age, upon whose lap lay a miniature blackboard and a tiny stub of chalk. You will have guessed this gentleman’s name by now, I fancy. 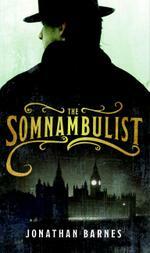 The Somnambulist. I began by asking Mr Moon about his conjuring act. He was polite enough in his replies but did not trouble to disguise his boredom. He did, however, pay tribute to the indispensability of the Somnambulist with what sounded to me to be genuine feeling and at this the giant grinned lopsidedly in pleasure. I asked Moon about some of his most celebrated successes - the Limmeridge Park Murders, the killing spree of the Warminster curates named Weddlebeach, Fickling and Gudge and the extraordinary sequence of events of the late 1880s which the popular press of the day had called “the Miracle of Mile End”. He answered my questions at length and with almost clinical precision, although I noted that he was not above positioning himself as the story’s hero in every instance despite the considerable evidence which has amassed to the contrary. It was only when I asked about “the Fiend,” the demented murderer for whose capture and subsequent incarceration he was undoubtedly responsible, that the mood darkened and my host became evasive and suspicious. The Somnambulist looked down at me and shook his head in silent rebuke. I made a note to myself at the time to investigate exactly why my mention of this notorious killer had met with so strange a reaction. When I subsequently attempted to do so, however, my efforts were forcibly rebuffed at the highest levels and I ultimately decided to let the mystery lie. If my career has taught me anything it is that there are times when it does nobody any good to know the truth. The mood had soured irrevocably and Moon seemed tired of my interrogation, sullenly batting away my enquiry about the debacle in Clapham and indicating, rather brusquely, that he and his companion would shortly have to retire to prepare for that evening’s performance. He said that I might be allowed one final question. The Somnambulist winced and, as his friend began to answer, I saw him write something on his chalkboard, seemingly scarcely aware that he was doing so. We said our goodbyes after that and I took my leave of the Theatre of Marvels. Just before I left, I leant surreptitiously over to see what the Somnambulist had scrawled upon his chalkboard. I’ve thought of our meeting many times in the past few years, especially since the exact nature of those events which eventually overtook Mr Moon have come to light and we have learnt at last precisely what that last great case of his was to cost him. He should have stayed in his theatre, I think. He ought never to have gone looking for mystery and danger, especially not in this new century where the rules seem so very different to anything to which he was accustomed. But most of all, I wonder about the Somnambulist. I wonder about exactly how much he knew, about what made him write “Pride” upon his blackboard that afternoon, about all the secrets that he must have kept. Only now do I realise that I was talking to the wrong man. It was the Somnambulist, I think, whom I should have interviewed all along.